Keeping your child engaged and motivated is crucial to improving his or her reading skills. If you're looking for ways to help your child read better, keep reading for a few tips. Instilling a sense of self-worth in your child can be of the utmost importance when it comes to reading. The more confident your child feels in his reading abilities, the more likely he is to focus on reading. Maintain a positive attitude at all times in regards to his reading abilities, and offer plenty of encouragement and praise. In order to motivate your child to read, it's useful to know what kind of reader your child is. There are children who don't read at all and those who read only for school. Then there are children who read both for school and personal enjoyment. If your child doesn't read or only reads for school, you can engage her and spark her interest in reading in several ways. Help your child set personal goals, such as reading a certain number of books within a certain time frame. It's important to give your daughter a sense of pride when doing so. You can motivate her by rewarding achievement; however, it's the pride that comes from a true sense of accomplishment that will likely keep her reading. There are also many things you can do to create excitement and pique your child's interest. For instance, look out for book events with local or national children's authors. Many authors give presentations about their books to children at local libraries or bookstores. Meeting an author can be motivating for your child because the author helps a book come alive. 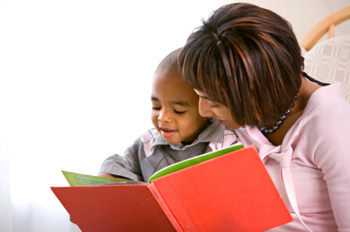 Getting your child to read for pleasure is often a major step forward in his learning progression. Take him to the library on a regular basis. The library may intimidate him if he isn't accustomed to going there. Once your child has toured the library and learned how to find books, give him a chance to check out books. Allow him to choose freely. Eventually, you can suggest books to your child and help nudge his interests in directions that will improve specific reading skills. Many kids who don't like reading many not have found the right book. Since children have different tastes and reading abilities, you may want to compile lists of recommended books. Your child can use these lists to find books that are perfect for his interests. Read what your child is reading to help her with comprehension. Make flashcards to help her with vocabulary and create lists of questions that spark reading discussions. Ask her to analyze character motivations in a text and predict what might happen next. Together, you can even act out important scenes with costumes and props. The key is to get your child to begin to think critically as she reads. You can also find a variety of websites that suggest reading activities and games that will allow your child to have fun as she improves her reading skills. You can also find online book clubs for kids that encourage her to share her thoughts on the books she reads with other students her age.